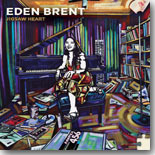 Eden Brent, aka Little Boogaloo, comes out of Mississippi with Jigsaw Heart, her best album yet. Two of our reviewers believed it was worthy of being this month's Pick Hit. Phoenix blues impresario Bob Corritore takes the spotlight on his new CD, Taboo, and delivers a collection of fine harmonica instrumentals for this month's Surprise pick. This month's Flashback covers a new album of vintage live recordings by John Primer & The Teardrops, including a killer version of the title cut, "You Can Make It If You Try!" Our What's New section features reviews of new CDs from Dave Keller, Jimmy "Duck" Holmes & Terry "Harmonica" Bean, Kenny "Blues Boss" Wayne, Walter Trout, Shane Dwight, Ray Fuller, Brent Johnson, Li'l Ronnie & the Blue Beats, Kenny Parker, and more.